Need a gourmet pick me-up? Our range of gourmet soup flavours make for a deliciously uplifting snack. 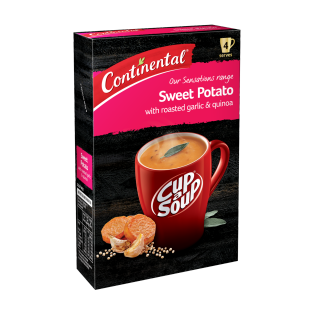 Try Continental Sensations Sweet Potato with Roasted Garlic and Quinoa! Starch (potato, maize), vegetable powders [sweet potato (11%), potato, onion], sugar, thickener (1412) (contains wheat), salt, maltodextrin, cream, yeast extract, quinoa (2.5%), creamer [vegetable oil (contains soybean derivative), glucose syrup, milk protein, mineral salts (339, 450)], mineral salts (451,452), natural flavours (contain milk), skim milk, sunflower oil, natural colour (paprika), garlic powder (0.6%), sage (leaves, powder), glucose syrup, celery seed. Contains naturally occurring glutamates. 1) Empty contents of sachet into a 250mL mug. 2) Fill with boiling water and stir for 15-20 seconds. Stand for 1 minute and stir again before eating. IMPORTANT... To ensure a smooth consistency, do not begin stirring soup until all the water has been poured into the mug. This soup is a Taste sensation!I have tried a couple more in this range & have found them all delicious...this one just happens to be my personal favourite! !